The price includes motorcycle rental, fuel, required equipment (helmet medium size) and optional equipment (turtle shield and knee pads),packed lunch, as well as the accompaniment of a professional guide. Price of the tour is based on a minimum group of 4 people. There are Yamaha bikes from 125cm³ to 600cm³. The base for the organization of this adventure is the Rafting Center Tara-Raft where you can book accommodation and food. Price per night depends on the type of accommodation you choose (3-8 €). It is also possible to reserve the full board at a price of 32€ and half board at the price of 20€ per person. Exciting enduro ride through the mountains of the Tara Canyon. Departing from Rafting Center Tara-Raft (434m). Enduro ride on macadam, forest roads and pastures and vast mountain plateaus that require basic and advanced knowledge of driving. Casual pause for sightseeing and photographing at the many vantage points. 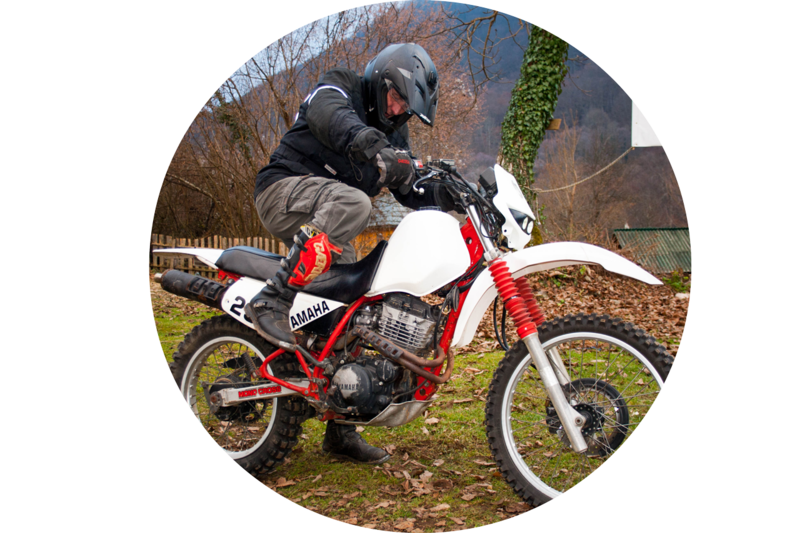 Exciting enduro ride in the mountains of NP Sutjeska. Departing from Rafting Center Tara-Raft (434m), bike transportation to Dragos sedlo (1300m). Enduro ride on macadam, forest roads and pastures and vast mountain plateaus that require basic and advanced knowledge of driving. Casual pause for sightseeing and photographing at the many vantage points. Visiting Rainforest Perućica, Vučevo and Prijevor. Base for the organization of these enduro adventure is our Mountain Hut on Zelengora (1400mnv). Price per night in a cabin is 15€ per person. Bring your own food, there is a fully equipped kitchen to use in the cottage. Attractive enduro ride on Zelengora mountain. Departing from our Mountain hut (1400mnv). Enduro ride on macadam, forest roads and pastures and vast mountain plateaus that require basic and advanced knowledge of driving. Casual pause for sightseeing and photographing at the many vantage points. Visiting Ljubin grob, Katun, canyon Hrčavka, Donjih i Gornjih bara (Lakes on Zelengora). Possibility of Hard Enduro: Climb to the Košuta (1800mnv). Unforgettable enduro ride on Zelengora mountain. Departing from our Mountain Hut (1400mnv). Enduro ride on macadam, forest roads and pastures and vast mountain plateaus that require basic and advanced knowledge of driving. Casual pause for sightseeing and photographing at the many vantage points. Visitin lakes: Orlovačko, Borilovačko, Kotlaničko, Štirinsko and Cicovsko lake. Exciting enduro ride in the mountains of NP Sutjeska. Departing from our Mountain Hut (1400m), bike transportation to Dragos sedlo (1300m). Enduro ride on macadam, forest roads and pastures and vast mountain plateaus that require basic and advanced knowledge of driving. Casual pause for sightseeing and photographing at the many vantage points. Visiting Rainforest Perućica, Vučevo and Prijevor. Unforgettable enduro ride on Zelengora mountain. Departing from our Mountain Hut (1400mnv). Enduro ride on macadam, forest roads and pastures and vast mountain plateaus that require basic and advanced knowledge of driving. Casual pause for sightseeing and photographing at the many vantage points. Visiting lakes: Orlovačko, Kladopoljsko and Cicovsko; and Neretva springs.